Unless you have a thing for chicken heads. Don’t let the head or feet scare you off though…soy sauce chicken is seriously delicious. Another time I walked into the kitchen and encountered this disturbingly phallic item. Not quite as tasty, but certainly an excellent source of gleefully immature amusement. Who knew marinated and simmered pig’s tails could inspire so many Lorena Bobbitt jokes? But enough of this edible exotic titillation. Back to the black tea and spice eggs. We’ll stick with the less intense preparations for now. 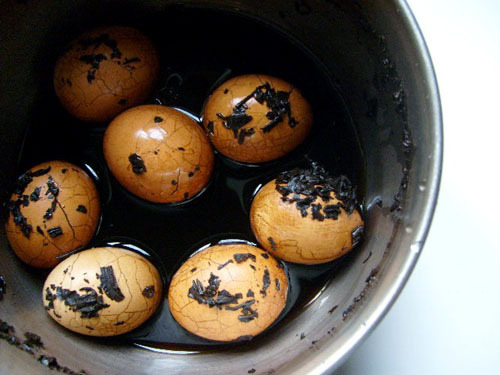 Tea eggs are incredibly simple to make and beautifully glazed like old pottery. I love the cracked glass spiderweb of tea and spice flavor threads patterned against the organic form of the smooth and shining egg white. There are a few more complicated versions of this recipe out there, but this one is nice and easy. We could claim it’s because we value simplicity and the beauty of uncomplicated recipes, but it’s really because Irene’s Chinese skills skills were limited to comprehending the major components as explained by Jenny. Which is not to say that Mei’s are any better. In fact, if Mei’s level of Chinese language skill corresponded to this tea egg recipe, Irene’s abilities would be a ten-course Imperial Banquet. So here’s our best explanation, but don’t worry. It’s pretty hard to screw up. A few tablespoons of Chinese black tea leaves ideally, or a few black tea bags. 1. Boil the eggs in just enough water to cover the eggs for 2-3 minutes, just enough to set the eggs. 2. Remove the eggs from the water and run under cold water or place in a bowl of cold water to stop the cooking and cool them enough to not burn your hands off. 3. Use the back of a large spoon to crack the shell all over the eggs. 4. Once the shells are cracked, place the eggs back in the water and add the rest of the ingredients and boil for about 3 hours. The longer you leave the eggs, the darker the glazed lines and the saltier the taste. You can slice and put the eggs on top of noodles or salad, make into an interesting egg sandwich, or just eat straight. We wouldn’t blame you.